Join us for our annual New Year’s Day Ride in San Manuel. Ready to Ride (RTR) at 9 AM sharp. Depending on group size and preferences our plan is to break into multiple groups of 8 or less each with a leader familiar with the trails to keep the ride more manageable. We will be riding either the TRS San Manuel Qualifier Course and/or some of the more technical terrain on the north side of Webb Road. Also, for those interested, TRS has made reservations at Carlota’s Mexican Restaurant in Catalina for an after ride meal at 2 PM. This “late” lunch is open to everyone riding this event. NOTE: TRS will contribute up to $300 for TRS member’s meals (you’re on your own for any alcohol). If you’re going to join us for the meal, please be back to the staging area at the school by 1 PM so we can get a good head count and all be at the restaurant at the same time. The qualifier course is a 25-30 mile C/B level ride; medium pace for me and any old farts. It will not be good for dual sport bikes or someone who has not ridden single track before. The trails north of Webb Road are more technical with step ups/downs, deeper sand washes, lots of loose rocks in places, some tight canyons and steep hills with lots of thorny bushes thrown in just to mess with you….. this area is something for more advanced riders. Strongly recommend a hydration pack lots of H2O, some power bars/snacks, etc. plus good protective gear and DEFINITELY some hand guards due to the cacti which is really overgrown on the trails in places. Join us for a fun ride. Hope to see you out there! Message George W or Mike Burke with any questions. 2015 New Year’s Day Ride In San Manuel, Possible repeat performance. ‘Tis the season of sharing and receiving gifts with friends and family. Some will spend considerable amounts of cash buying gifts this season. Others will spend much less and stay within their budget. Sometimes you may receive a gift that outwardly appears insignificant, inexpensive but possess tremendous personal value. Well this is exactly what has happened to me. While walking into East Coast Super Subs the other day for a club meeting, I noticed a Honda motorcycle parked near the entrance. What caught my attention was the license plate frame mounted on the rear fender of the bike. Inside the outer edge of the frame were the words Otto Brothers Honda. I thought, “That shop is familiar to me, I wonder if it is the one I used to visit when I was a kid.” So I went into East Coast Super Subs and saw some other TRS members sitting at a table. I asked who owned the Honda outside with the Otto Brothers Honda license plate frame? Well John Bingham responded it was his. He went onto confirm this shop is the one I remember from the days of my youth. So I sat down and proceeded to relate to John my story. As a pre-teen, my neighborhood friend Paul and I would ride our bicycles or sometimes walk, if our bikes were broke, to the Otto Brothers Cycle shop on Ogden Road in Lyons Illinois. We would spend time in the shop dreaming of which Honda 50 or 70 we would get if we had the money. Next, Paul and I would debate which color was best, the dark cherry red or the bright blue. After awhile when it was obvious to the guys in the shop that we were not there to buy anything, we were politely asked to leave. Once outside the shop, we’d buy a Dr. Pepper from the vending machine for something like 25 cents, and head for home. John appreciated the story and shared some history about the shop and its owners. After the meeting, John hands me a small, outwardly insignificant and inexpensive key ring fob. It is from Otto Brother Honda. The key fob looks old, probably issued around the time Paul and I made our annoyance visits to Otto Brothers. Well John leaves and I still have the key fob. So later I ask him if he meant to leave the key fob with me and he said yes. Enjoy the fob he says. Well to me this key fob holds tremendous personal value. Why? Because this is a reminder of where it all began for me, that is the love of motorcycles, especially the dirt bike kind. But my story continues on from those days of Otto Brothers. Even though I saved up my paper route money, I was never allowed to buy a Honda 50 or 70. I had to wait until I was in my early 30’s to get my first bike. But during all the time in between, I would recall those Otto Brothers days fondly and with inspiration. Now look at me, Chief Instigator of TRS, more dirt bike t-shirts and riding gear than I know what to do with, 2 bikes and artificial body parts. Thanks Otto Brothers! To you John, I say thank you for the gift, at least that is what I will call it from now on. Merry Christmas, Hanukkah, Kwanza or Festivus or whatever you honor this time of year and a Happy New Year to all of you and your families. We need someone in TRS that is good with an auto style paint gun. Trail barriers will fabricated soon and once the welding is done we need a painter to finish the project. All materials will be supplied, just need the person with the right skills. A few have asked about tentative dates for the Copper Classic Work days. We may not need all of these days, it depends on how many club members volunteer and how much work needs to be done. The January & February dates are intended to make the course safe and ready for use come race day. March 2 & 3 is when we place the wood stakes out on the course to be later tagged with directional, danger & wrong way arrows on the Friday before the race. This is a key weekend for us. The February days below have been adjusted from what was discussed at the Planning meeting on Monday night. Please save these dates to your calendar. You can start replying now as to which dates you are available. TRS has started to develop a closer relationship with NOHVCC this year. Since the start of the Red Springs Single Track Trail Project, TRS has relied on NOHVCC as a source of trail design & building information and guidance on how to work with Land Managers, such as the US Forest Service. Recently we have been in contact with Geoff Chain of NOHVCC. He is mentioned in the article. Geoff has committed to join us at some point to take a look at the trails out in the Red Springs area. He has also been invited to attend a TRS club meeting. Stay tuned for more news on this topic. There are still a few key tasks that need to be assigned to volunteer or two. Please consider helping out. A message from our own Russell Hacker, Southern Az. 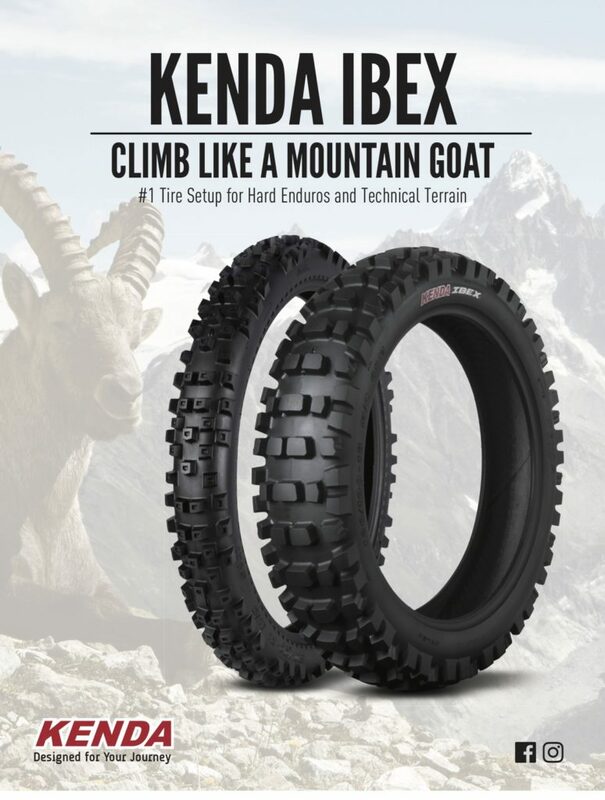 Tucker rep.
Kenda’s new Ibex tire is in stock with Tucker rocky and will be ready for sales in Tucson this next week. 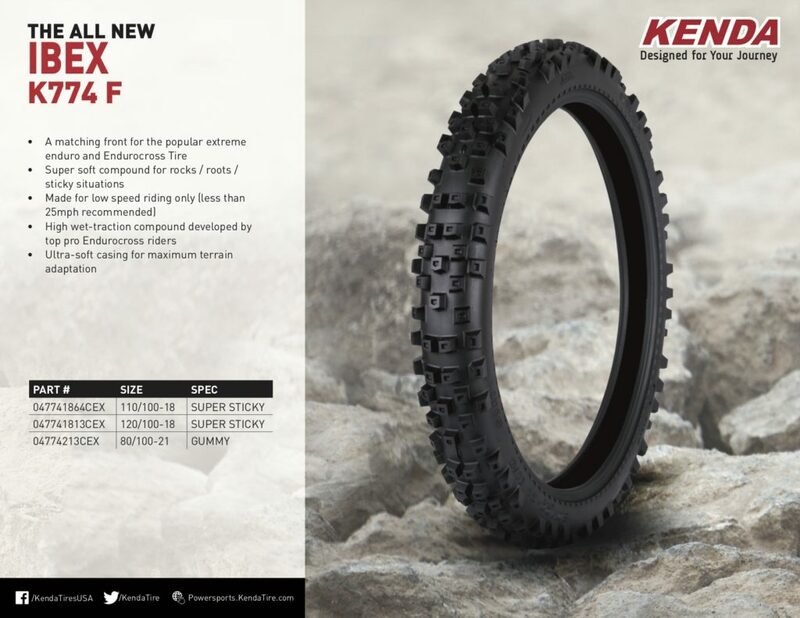 Kenda claims that this is the tire TRS Riders have been waiting for. They will also be available at Serranos Motorsports the Home for all your OFF ROAD need’s. Those at the club meeting last night had a chance to check out the wonderful cutting board given to us by the East Santa Cruz Community Food Bank. We received this gift from them as a token of appreciation for our $1,500 donation. We discussed how to best utilize this gift. There were a few suggestions presented last night. Where to ride for our traditional New Year’s Day ride? The following were suggested at last night’s meeting. 3. San Manuel & North of Webb Rd. TRS President will discuss with the other club Officers about possibly using club funds for a meal after the ride. It’s now official; the Decision Notice to proceed with the construction of the Red Springs Single Track Motorized Trail System has been signed and released. However, the trails are not yet open for use and there are still a few additional hurdles to clear before we can actually break ground. Brief history. 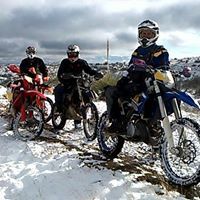 This is an Arizona State Parks & Trails OHV Program funded project managed in conjunction with the US Forest Service, Nogales Ranger District and Trail Riders of Southern Arizona. It is located in the Tumacacori Mountains of Nogales District, Coronado National Forest, west of Tubac. Over the past three years TRS and the FS have been working on this project in the form of NEPA, Public comments, trail mapping, trail design, hiking the proposed trails, re-routing sections for sustainability, endangered cactus surveys, etc. The system of trails will cover about 25 miles and be open to Dirt Bikes, Mt Bikes, Equestrian and Foot travel. TRS wished to thanks all the volunteers who have participated in the supporting the work required to get to this stage of the project. Over 700 volunteer hours have been recorded thus far in support of the project. We also thank the Forest Service for their support and guidance received along the way. So stay tune, there will be additional opportunity to volunteer in the very near term.